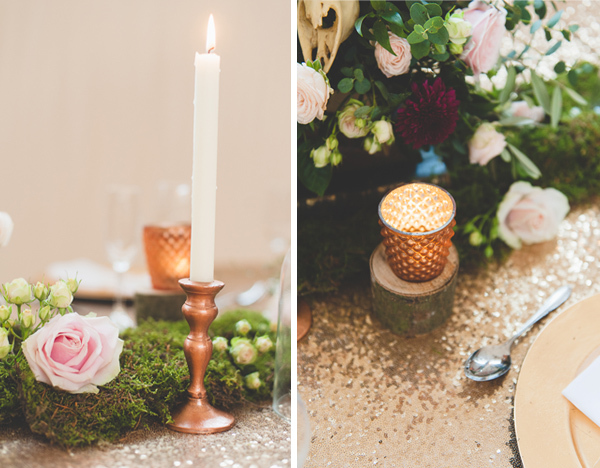 Copper really has been the metal of the moment in the world of weddings. 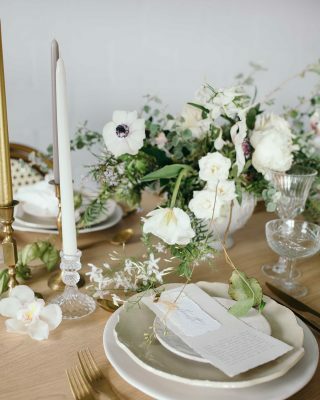 Team this chic shade with natural earthy elements, such as moss, and you’ve got yourself a seriously stylish wedding theme. Find out how you can pull off a rustic glamour wedding table, with the help of Fleur Couture. It’s impossible not to fall head over heels in love with a rustic glamour wedding day. 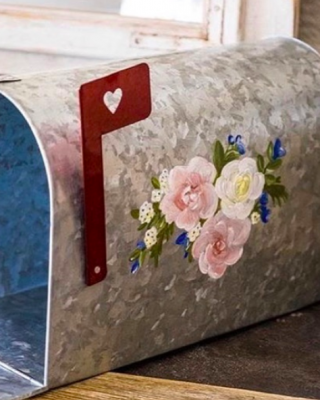 Fusing together wooden and natural details creates a wonderfully rustic effect, while the dashes of metallic and sparkle add a touch of glitz and glamour. 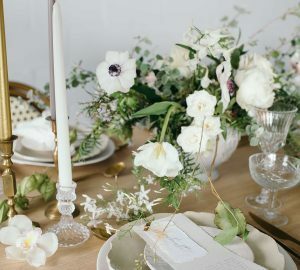 Working together as the perfect ingredients for a show-stopping wedding theme, it’s effortlessly easy to recreate. 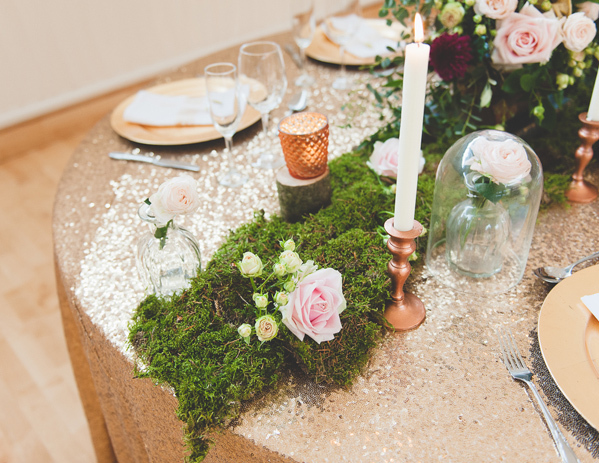 You’ll need a glittering copper, gold or bronze table cloth to use as the base for your rustic glamour wedding table. 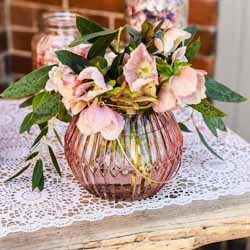 This will immediately sprinkle your special day with handfuls of sparkle and it’ll twinkle beautifully in the company of candles and as the evening draws in. Line the length of your wedding tables with our dried carpet moss – this makes a unique table runner that will help to give your tables a rustic feel. 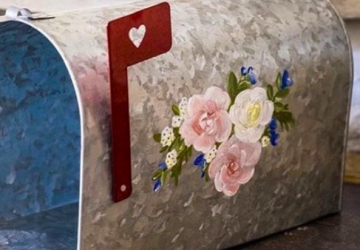 For an extra floral touch, work in a few of your favourite flowers along the moss runner. 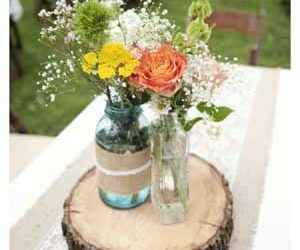 It’s time to think about your wedding candles: a must-have at any rustic glamour wedding! 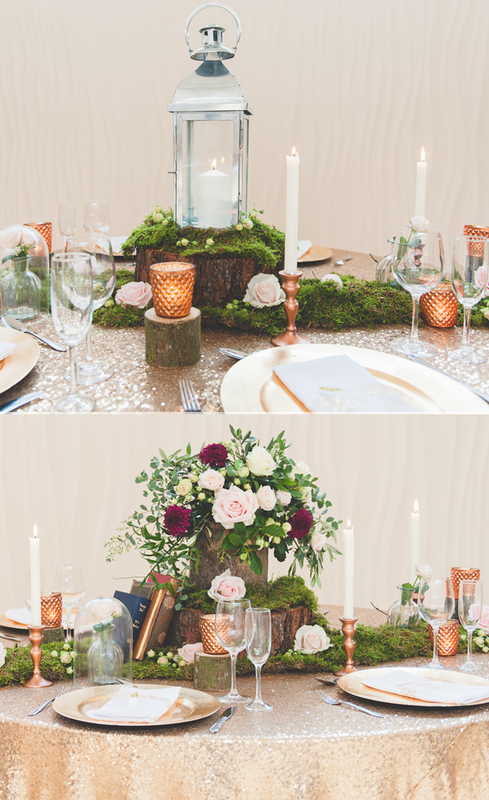 Our copper candlesticks and quilted copper tea light holders will look striking against the contrast of the moss. They’ll also help to give your tables an warm glow. You can use as many or as little as you fancy. Nestle amongst the moss or line along the edge – you can experiment to see which style you prefer. Our collection of wooden tree slices make fabulous table centrepieces when used alongside lanterns, candlesticks and tea light holders. 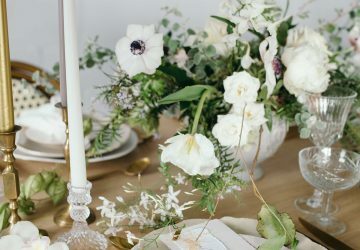 You could use a variety of different sizes and styles to create a unique rustic glamour wedding table. Opt for copper plates and metallic cutlery for seriously show-stopping place settings – your wedding guests will feel luxurious! 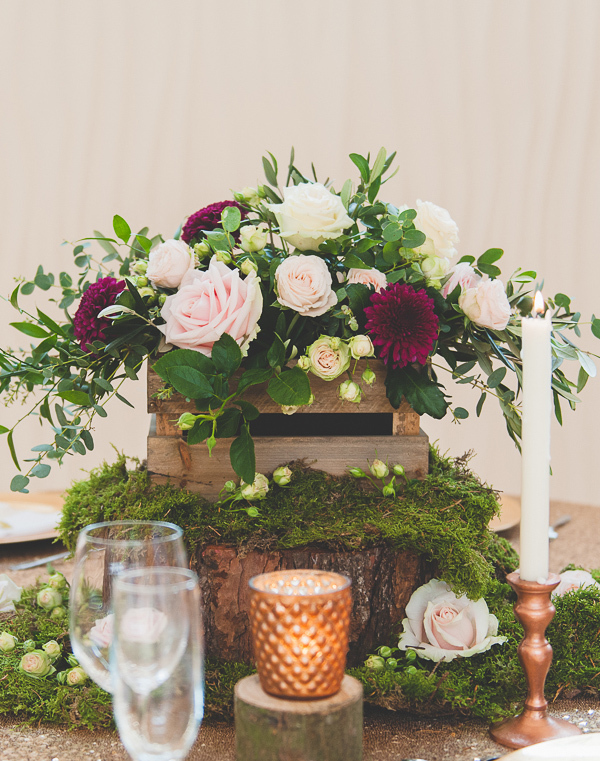 We’re huge fans of wooden crates at weddings as they’re such a versatile decoration. 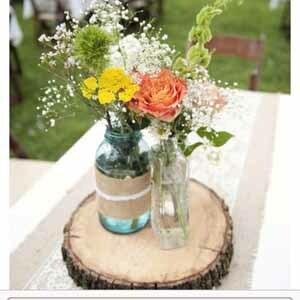 A fabulous choice for a rustic glamour wedding table, they make the perfect centrepiece! Place on top of a tree slice adorned with dried moss, and fill with billowing blooms and wild greenery. 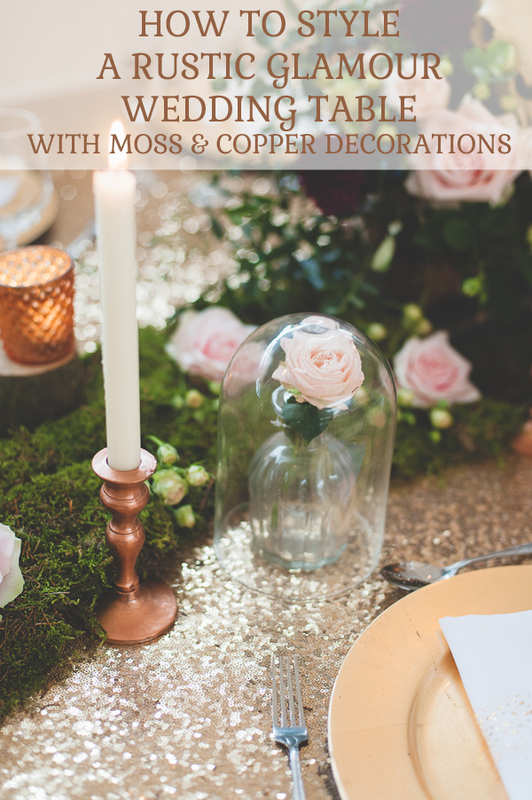 Set against the backdrop of a glittering copper table cloth, the combination of decorations will look truly stunning. Photography by SDS Photography. Florist and Styling by Fleur Couture.